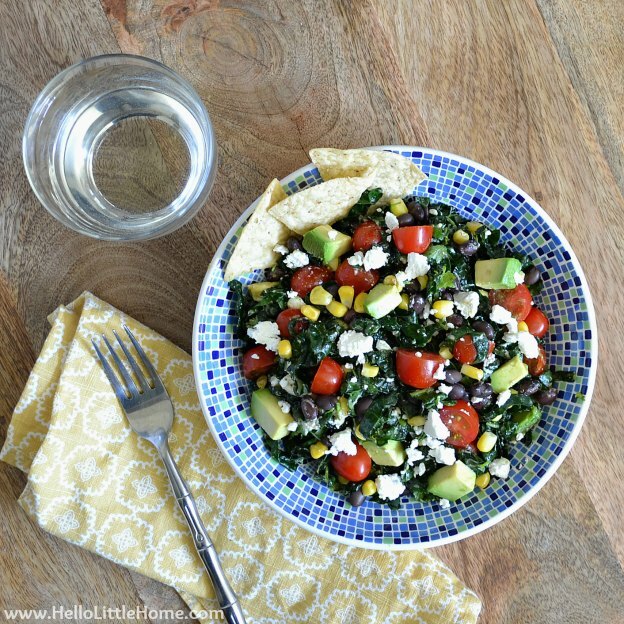 Enjoy a delicious and easy to make Mexican Kale Salad with Chili-Lime Vinaigrette! The weather here in New York was a little crazy this weekend. On Saturday, it was hot and sunny one minute, then pouring rain the next. My husband and I walked down to the Lincoln Center for a Beatles exhibit, and we just missed getting drenched. Have I mentioned that I hate rain? By Sunday, the storms were gone, and we spent most of the afternoon in the park enjoying the weather. It seems like everyone in the city was out and about, and there was some seriously good people watching. Like the Grim Reaper rollerblading around the Central Park loop … only in New York? Of course, a lazy day in the park wouldn’t be complete without a picnic! Now, I’m a huge fan of taco salad (the kind with crushed Doritos), but it’s not exactly healthy. So I did a little experimenting and created a Mexican Kale Salad with a Chili-Lime Vinaigrette. It’s the perfect thing for a lazy weekend picnic. This isn’t your typical kale salad. Have you ever had one with tough, chewy bits of kale? Sure, it’s healthy, but it’s not exactly enjoyable to eat. I think that’s what my husband was expecting when I told him this Kale Mexican Salad with Chili-Lime Vinaigrette was on the menu! There are a few tricks to an enjoyable kale salad. First, I like to use lacinato, or “dinosaur,” kale, which isn’t as tough as curly kale. Next, toss the kale with a little olive and salt. This softens up the leaves and breaks down their waxy coating. Finally, instead of just tossing the vinaigrette with the kale, use your hands hands and massage it in. Yes, it’s a little strange, but it makes big difference. 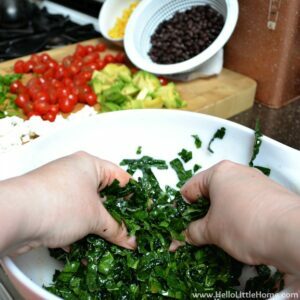 My husband was pleasantly surprised by this Mexican Kale Salad, and I think you will be, too! It’s full of flavor and filled fresh veggies and other healthy ingredients. The Chili-Lime Vinaigrette is sweet and mildly spicy, and it adds just enough richness to the salad. Give it a try at your next picnic or pair it with your favorite meal … chili, sandwiches, and more! This Mexican Kale Salad is bursting with fresh, delicious flavors! 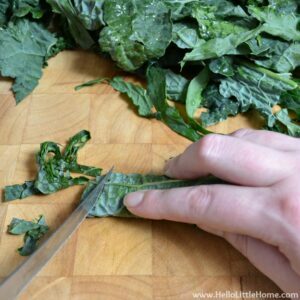 Remove kale leaves from stems (see note for help). Stack kale leaves and roll up. Slice about 1/4-inch thick. Add sliced kale to a large bowl. Toss with 1 tbsp. olive oil and 1/2 tsp. salt. Set aside while you prepare the remaining salad ingredients. 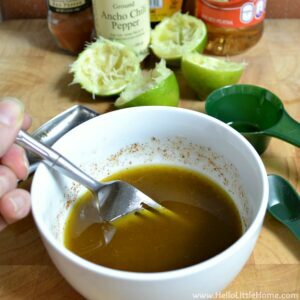 In a small bowl, combine lime juice, apple cider vinegar, cayenne, ancho chili pepper powder, maple syrup, olive oil, salt, and pepper. Taste vinaigrette and add more salt, if necessary. Set aside. Take a minute to massage vinaigrette into kale, using your hands. 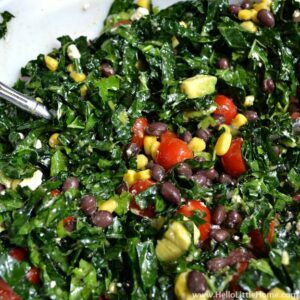 Top kale with cherry tomatoes, black beans, cilantro, and corn. Toss to combine. Add avocado and feta cheese to salad. Fold in gently. Serve salad topped with tortilla chips (optional). To remove tough stems from kale leaves, grab onto top of stem and quickly slide your hand down, separating leaves from stem as you go. If you can't find ancho chili pepper powder (I got it at Penzeys), replace it with regular chili powder. 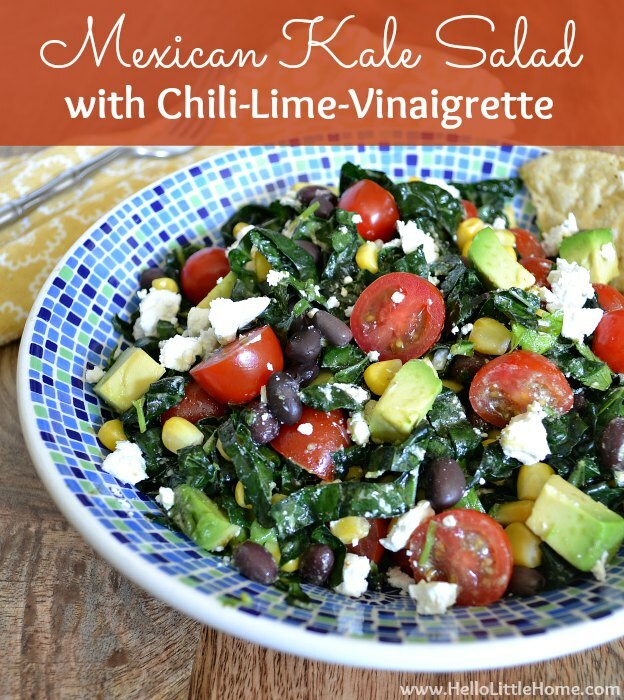 Want more recipes similar to this Mexican Kale Salad with Chili-Lime Vinaigrette? 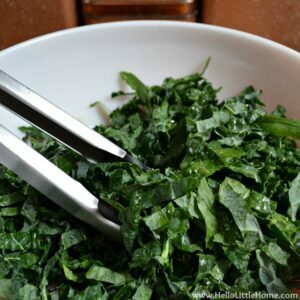 There is so much you can do with a yummy kale salad … hope you enjoy these recipes! Do you have a favorite picnic food? Lovely salad! Good to meet you at twitter. 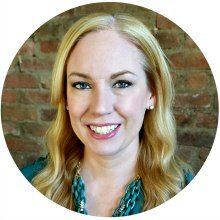 I too blog for Meatless Mondays :). Ginnie, your salad looks fabulous! 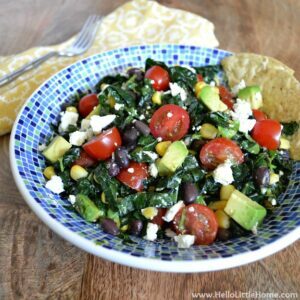 I love kale And I love Tex-mex flavors so I am sure this would be a winner in our house….pinned to try. found at sweet bella roos linky. Hope you are having a wonderful week..And, tee–hee…cutting back on carbs at my house too…funny…. Thank you! I hope you try it – it’s really good:) It’s so hard to cut back on carbs … ha ha … always a favorite of mine! I just bought a huge bag of kale and was going to make chips with it, but now I think otherwise! Thanks for sharing at Fridays Unfolded! I love the use of kale and the delicious flavor combination you put together!! These look really good! I’m definitely pinning it! 30+ Delicious Low Carb Side Dishes - Wife. Mom. Geek. I’m going to have to add this to my Meatless Monday rotation! Fresh, local dinosaur kale is only available for another month or so until it gets too hot to grow it in the valley!